Jumbo sized Crimson Red Rhubarb grown in the Pacific Northwest will produce large, thick, red stalks of rhubarb. These crowns are propagated from a division, which means every stalk will be red inside and out. The weight per crown is 14 oz. on these jumbo sized divisions. 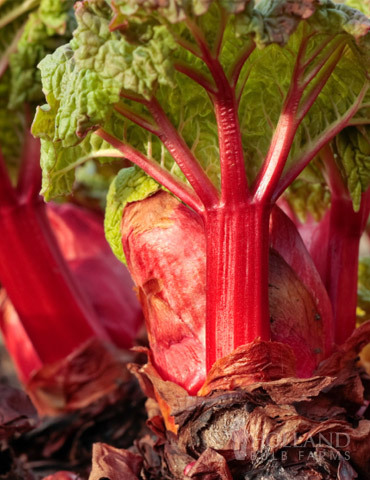 The larger the rhubarb crown the more energy is retained, crown size is directly related to the time it take to establish rhubarb that can be harvested. Therefore since these crowns are jumbo sized the harvest time is sooner. For maximum production rhubarb prefers full sun for 8-10 hours per day. Make sure to amend the plating bed with organic matter, and that the soil is well drained. Just received my rhubarb plants. They look healthier then any other companies plants. I’ve already planted them and waiting for them to grow and make jam.